A series of screenshots were tweeted from well known HTC leaker @LlabTooFeR this morning, supposedly showcasing our first true look at the One (M8) running Lollipop and Sense 6. From first glance, you can instantly tell it is Lollipop and not Kit Kat, thanks to obvious changes in the recent tasks list, which shows us previews of applications, not just thumbnails. To follow that, HTC looks to have implemented the double swipe down motion for the notification bar, with one swipe being your notifications, and two swipes being your system toggles. From a look at the lockscreen, HTC appears to be keeping it rather stock, allowing for the system to display notifications for users. Overall, if you ask me, it looks rather tasteful. Officially, HTC already announced that One owners should expect to see the Lollipop update hit their devices within 90 days from November 3, but it would not surprise us if it came a bit quicker. The only true challenge is getting US carrier approval for a timely rollout. 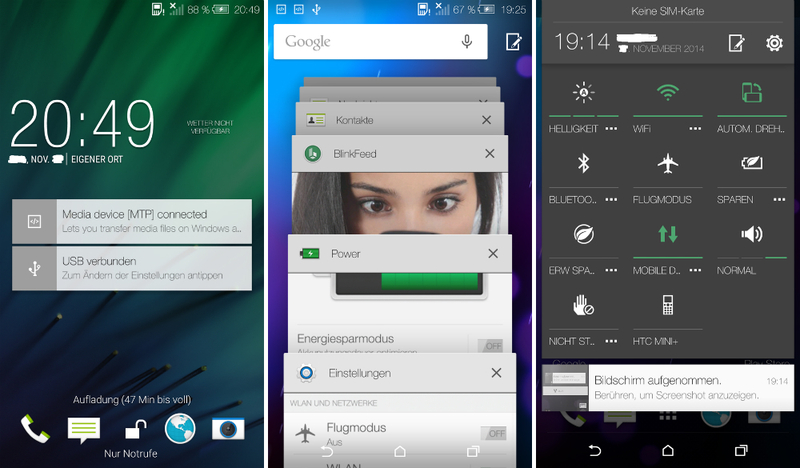 HTC fans, how do these screenshots look to you? Do you dig the color scheme or the flatness of Sense 6?